It’s important to ensure that the combination of the selected stain and finish are compatible. There is no doubt that wood flooring is part of a growing global market. Never before in our history have consumers had so many wood flooring options available to them. New installations pose no issues in meeting a customer’s expectations, but what happens when you are dealing with existing wood floors? How can you install new wood that blends seamlessly with floors installed decades ago? How can you change existing wood floors to achieve an entirely new look? 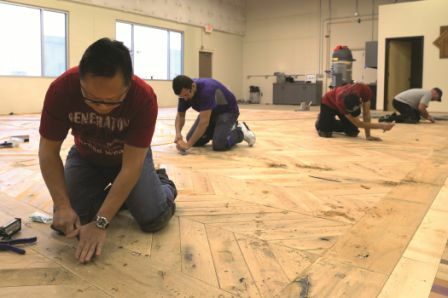 Addressing these and other issues is the focus of the National Wood Flooring Association’s (NWFA) Advanced Sand and Finish hands-on training. As with any wood flooring sand and finish job, safety is a key consideration. Because you will be working with a variety of powerful and potentially dangerous machinery, you should read and fully understand the operation manuals for each machine you’ll be using. Be sure you have the proper power available, use the tools only as intended, unplug machinery if adjustments are necessary, and clean all machinery both before and after each job. This will ensure they continue to perform properly. Your personal safety is important as well. Wood dust is a known carcinogen, so wearing an approved respirator is a must, as are wearing eye and ear protection. The grit used on the first sanding step should be the finest grit possible to achieve everything previously mentioned, while minimizing the scratch pattern being left behind. Fire is also a significant safety concern when sanding and finishing wood floors. Friction from dull sandpaper, using the wrong sandpaper, sparks from sanding over-exposed nails, spontaneous combustion from improper disposal of wood dust and stain rags, vapors from finishes, and even smoking are all potential hazards on the jobsite. Turning off pilot lights can help minimize risk, but only proper safety procedures can prevent potential disasters. Once all precautions have been taken and the jobsite is ready, choosing the right sandpaper sequence is crucial for a successful end result. You should only use as coarse a sandpaper grit as necessary to remove existing coatings and flatten the floor, while being careful to not over sand the wood. Before sanding, evaluate the wear layer thickness in several areas to ensure whether you should attempt resanding. Generally, if the wear layer is less than 3/32 “, then the floor should not be sanded. Once you determine the floor can be sanded, you need to select your sanding sequence. Choosing the proper grit sequence for every situation is nearly impossible to define as there are a wide variety of circumstances that may dictate many different sanding scenarios. 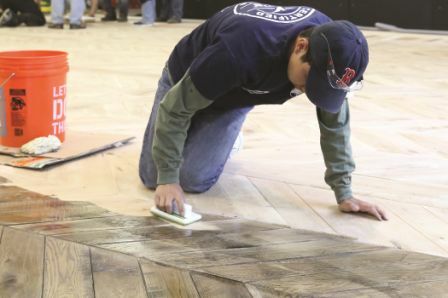 The grit chosen for the initial sanding may be determined by several conditions including: the type of existing coatings; the degree of unevenness; the species; and the overall condition of the flooring. The grit used on this first sanding step should be the finest grit possible to achieve everything previously mentioned, while minimizing the scratch pattern being left behind. A typical grit sequence for a new installation might be 50, 80, and 100. In this scenario, the 50-grit sandpaper will leave deep scratches in the floor. The 80-grit sandpaper will remove the deep scratches and leave shallower scratches. The 100-grit sandpaper will remove the shallower scratches left by the second cut. The result will be even more-shallow scratches that feel smooth to the touch. It’s important not to skip any step in this sequence. If you skip the medium grit sequence, for example, and go from the coarse 50-grit paper directly to the fine 100-grit paper, the 100-grit paper only removes the top of the peaks left by the coarse paper, leaving the deeper scratch marks, resulting in a rough surface. If stain is added in this situation, then the deep scratches will be much darker than the rest of the floor, resulting in an uneven finish. Once you determine the floor can be sanded, you need to select your sanding sequence. Most sanding jobs will start with the belt or drum sander, sometimes referred to as the big machine. The first cut should be with the highest grit possible in order to flatten the floor and remove old coatings. The cut should be at a 7- to 15-degree angle for optimum flattening on a straight lay floor. Next, proceed to the medium and fine grits working at a slow walking pace. Stagger starting points to alleviate troughs and straighten out the machine to run parallel to the flooring. 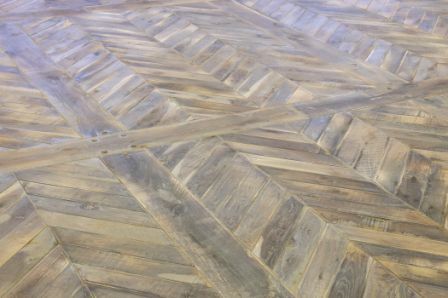 If sanding a patterned floor, the first cut should be with the highest grit possible in order to flatten the floor and remove old coatings, maintaining grit sequence from coarse to fine. Start at a 45-degree angle and start the second cut at the opposite 45-degree angle. 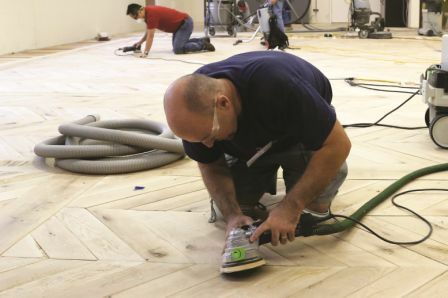 The third cut should remain at a 45-degree angle to the flooring grain to ensure no piece of flooring is being dished-out by cross-grain sanding. For areas that can’t be reached by the big machine, an edger can be used. Using the same grit sequence as the big machine, first flatten the floor, and then pull out the swirls. After sanding, a buffer or planetary sander should be used to abrade the floor to a final finish. Multi-disk/planetary sanders are ideal for flattening a floor. These machines can minimize soft grain dish-out and scratches. They are ideal for multi-directional floors and produce premium results that are as close to furniture quality as possible. Staining wood floors can help match new flooring to existing floors, and water popping can prepare wood floors to accept stain more readily. Water popping opens the wood grain to allow more stain infiltration into the wood fibers, resulting in a darker and richer color. To water pop a floor, wet the entire surface of the floor consistently using rags, applicators or sprayers. Don’t over saturate the floor and be sure to allow all of the water to completely flash off overnight before applying stain. You should moisture test before applying stain as well. Once the floor is detailed and thoroughly vacuumed, stain can be applied. It can be applied by hand using rags, with an applicator, or with a buffer. Darker stains contain more pigments and take longer to dry. Other alternatives to stain include aniline dyes and reactive chemicals. All of these options can be carefully manipulated to match existing flooring, and it’s a technique NWFA covers in its Advanced Sand and Finish training. No matter what your level of experience, it’s important to create samples for your customer to approve before staining the floor itself. Have your client sign off on the approved sample to ensure expectations are met. Finally, it’s important to ensure that the combination of the selected stain and finish are compatible. Not all products are compatible, even those from the same manufacturer, so you want to make sure the products you’re using will perform well together to produce top-quality results. Staining wood floors can help match new flooring to existing floors, and water popping can prepare wood floors to accept stain more readily. By learning and practicing the proper techniques, you can provide highly skilled services that will differentiate yourself from your competition, and generate premium rates. You can learn more about sanding and finishing techniques by attending the NWFA’s Advanced Sand and Finish training. A schedule of available training opportunities is available here, or by contacting the NWFA at 800.422.4556 (USA and Canada), or 636.519.9663 (international).